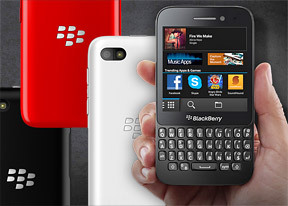 The BlackBerry Q5 comes with an 5MP main camera with an LED flash and a secondary 2MP camera. Both cameras can shoot HD video, 1080p for the main camera and 720p for the front-facing one. The BlackBerry Q5 offers three shooting models - Stills, Video and Time shift, the mode toggle is in the bottom right corner. Next to that is the Menu key, which offers several settings including a front/back camera switch, flash mode and aspect ratio (1:1, 4:3 or 16:9, there's no resolution setting). Also here are the Scene mode toggle (Auto, Action, Whiteboard, Night, Beach or Snow) and the Shooting mode toggle. The still camera can just snap pics, do digital image stabilization or enable burst shot. Burst shot photos are snapped at full 5MP resolution. Photos are taken by just tapping the screen. You can use the volume rocker or the Space key as well, but we found no way to focus reliably If burst shot is enabled, then the camera will snap pics in quick succession while you have your finger on the screen. We had issues with the autofocus - many of the shots we took were out of focus. Most often the focus was just slightly off, but sometimes it was very wide of the mark and resulted in blurry images. The Q5 erroneously focused close by even though all the objects in the scene were far away. Touch focus is available but you have to drat the focus point, not just tap on the screen. Digital zoom is here too, it's activated through pinch zooming, but we would advise against using it. The BlackBerry Q5 camera UI has two handy shortcuts. A thumbnail of the last photo you've taken is in the lower left corner and you can tap it to go to the gallery. Better still, you can swipe it to enlarge that photo for a quick view of how it turned out, and it will be minimized again when you lift your finger. The camera also has a feature called Time Shift - an increasingly popular and very cool trick that is making its way to a number of smartphones recently. It snaps several photos in quick succession with just one tap at the screen and automatically selects the best one. It also detects faces in the photo (which can take several seconds, depending on how many faces there are). Once that's done, Time Shift allows you to tweak the photo - pick a different photo from the 11 that were captured and for each individual face that was detected, you also get to choose from 11 snaps. The BlackBerry Q5 is the first 5MP shooter of the new generation BlackBerries. Like the Q10, it oversaturates colors, but the Q5 has taken it to ridiculous amounts. As a result, all the images appear as if painted rather than shot and the noise level has increased unnecessarily. The saturation isn't balanced either, the color channels are boosted differently, which throws off the white balance (some photos had a heavy tint). Once you get over the saturation, the camera isn't really that bad for a 5MP shooter. There's decent amounts of fine detail for the most part, but post processing lets down the Q5 once again - noise reduction seems to be adaptive as some areas of the image exhibit heavy smudging (mostly shadows and high-detail areas), while other don't. If you put the photos through an image processing app and tone down the saturation will result in okay looking shots, but the extra noise is forever sealed in the JPEG and we really don't want to do any post processing. We also tried the HDR mode, but it seemed to make the focus issue worse. The alignment between the two images with different exposure isn't perfect either and the results are pretty disastrous. 5MP shooters are getting rare these days, but there are still plenty you can compare the BlackBerry Q5 against. The Q10 is also there with an 8MP camera. The third chart will give you a good idea of just how much the Q5 oversaturates colors. 1080p videos are stored in MP4 files with 16Mbps total bitrate. Stereo sound is recorded at 192Kbps bitrate and 48kHz sampling rate. In terms of image quality, the Q5 camera makes back some lost points. The clips produced are smooth at a consistent 30fps and while we've seen more detail out of 5MP / 1080p shooters and colors are once again oversaturated, there's no visible noise. Here's a sample video recorded with the BlackBerry Q5 that we uploaded to YouTube. You can also download this sample (0:07s, 13.8MB) that hasn't gone through YouTube compression. The 1080p video recording prowess of the BlackBerry Q5 makes it equal to its higher-end sibling, the Q10, in terms of video capture, not to mention every high-end phone out there. Our Video quality compare tool pits it against all of them.